Who does Fergus watch the Quidditch match with? Recent update: Chapter 11 is live. 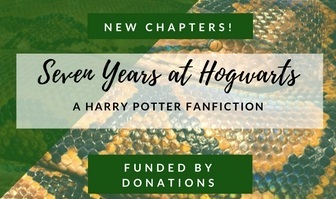 We now need donations to kick off the next chapter! So, I came up with a new concept recently which I hope will encourage some people to get involved~! I have written fanfiction on and off for quite a while, and some of my previous pieces became kinda popular... at this moment in time I'm also in need of FPs, more and more, to keep up with all of the items that I want to buy. Here's where the concept comes in. I'm creating a "fan fiction shop", except, since anyone can read it once it's done, I'm not expecting just one person to donate fps. Each chapter will be written and posted once I have reached a certain donation level; that will be explained more later, as well as the perks that you can get along with your donations. Before I wrote the first chapter, I asked you to vote on which fandom I should choose. Now we have settled on Harry Potter, and you can see the archives of previous votes down below. Get voting, spread the word, and be ready for the next chapter! To get you in the mood, here are a few examples of my fanfiction written in the past... Please be aware that some adult themes or language may be present if you visit these links. Spoiler: Which house should our OC be in? Spoiler: Which house should Jeremy and Chrissie be in? x Or keep to himself all night? Spoiler: What is Fergus' first lesson? Second most votes decides his second lesson. Spoiler: How's Fergus at Quidditch? Spoiler: What happens at the Halloween dinner? Spoiler: What's Fergus' most pressing problem? Whoops, forgot to record this one! Sorry! But the winner was: Blaise keeps giving him fashion tips, with 100% of the votes. Vote cleared by donation with buyer's twist added! Would it be possible for Blaise to take Fergus out shopping and ... Fergus impresses Draco? Something like when he found out that Goyle (Harry) could read? As a bonus at the end of the chapter?" Spoiler: Christmas is coming! What big question does Fergus have to answer when the snow falls? Spoiler: Does Fergus find the Mirror of Erised? Any wishlist item from the shops is valued at its shop price! If you donate enough to clear the donation metre in one level, without donations from anyone else, then I will allow you to choose the outcome of the next vote yourself. You can control the story! If you double the donation amount needed, you can pick a secret twist for the next chapter. No one else will hear about it until the chapter goes live. Donators will be named on this front page, but I will leave your name out if you prefer, and I will not reveal your donation amount. CURRENT SPECIAL OFFER: convince 5 people to come and vote/comment on the thread quoting your username, and I will fill the next donation meter to the top and allow you to add 5 extra votes of your choice to the current poll! Bump from the bottom. I need 7 more votes to continue so we're getting there. If you voted "choose another", please suggest an alternative.